Feature Image Credited to Stop Smart Meters. Are you aware that many utility companies have replaced the need to send a representative to your home to "read the meter" with a Smart Meter? These meters transmit pulses of wireless radiation between 9,600 to 190,000 times a day. Chronic exposure to such radiation can cause health issues. This week, I explain how easy it is to reduce your exposure by dumbing down your meter. Subdivision: rows of streets, houses, meters and overlapping radiation. Smart Meter electrosmog, represented by the large red circles. The small circles represent meters. Many houses have more than one electric meter, in addition to smart gas and water meters, Wi-Fi, cordless and cellular phones, enabled appliances, etc. This picture cannot begin to represent the multitude of wireless signal overlap. While cell and cordless phones, wi-fi routers and laptops emit radiation that is measurable within inches (cell phone and laptop) and a few feet (wifi router), cell towers, collection meters and Smart Meters can emit higher levels of radiation over far greater distances nearly constantly. The FCC cannot determine what portion of the allowable public safety limit is already being used up by wireless devices in the typical home, i.e. cell and cordless phones, PDAs and tablets, wireless: routers, home security systems, baby monitors, garage door openers, etc. Even if a consumer eliminates all possible wireless exposures within their home, they may face excessively high exposures from Smart Meter mesh networks on a 24-hour basis. According to a California Environmental Study, "In addition to exceeding FCC public safety limits… Smart Meters can produce excessively elevated radiation exposures… for occupied space within dwellings, or outside areas like patios, gardens, (dog runs) and walk-ways… levels are predicted to be substantially elevated within a few feet to within a few tens of feet from the meter." And this does not account for the overlap of chatter within a mesh network, which can exponentially increase the number of signals. The World Health Organization classifies wireless radiation as a Class 2b carcinogen, like DDT and lead. Studies by University of California at Santa Cruz Professor of Nuclear Policy Daniel Hirsch show that the whole-body cumulative radiation exposure from wireless meters is 100–160 times more than cell phone exposure. This means that if you have a Smart Meter or are in a mesh network that you and your loved ones, i.e. family members, children, friends and pets, may be exposed to unhealthy levels of radiation which assault biological systems. Tens of thousands of scientific studies report adverse health impacts with chronic exposure to wireless radiation at or below levels produced by Smart Meter mesh networks. "Electrosensitivity, also known as Electromagnetic Hypersensitivity (EHS), is a disabling condition in which an individual experiences a myriad of symptoms, like headaches, dizziness, unusual heart palpitations, or insomnia, around wireless technologies or electrical devices. EHS can develop gradually from many years of 24x7 exposures to radiation from sources such as Smart Meters, cell towers, Wi-Fi, mobile phones, cordless phones, power line magnetic fields, intermediate frequencies, and electric fields from various electronics devices." Some individuals are particularly susceptible to the effects of wireless radiation. For instance, children absorb more wireless radiation and differently than adults. And individuals who have metal implants, some medical conditions, certain medications or compromised immune systems may be particularly at risk. So the compromised, ill, elderly and young may respond more acutely to wireless radiation exposure. 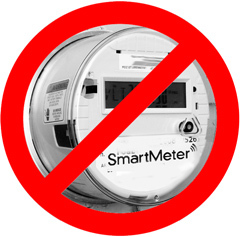 Call your utility company and inform them that you have become aware that a Smart Meter has been installed on your property and that you need to "opt out" of the Smart Meter and have it exchanged back to the analog meter. And ask your neighbors to do the same as the mesh network of Smart Meters around you exposes you to constant chatter and high levels of background radiation. My Smart Meter was installed in August of 2014 without me understanding its dangers. I called the utility company to opt out. They asked me how it was affecting me. I told them it was contributing to nervous agitation. The very next day, I had an analog meter! There was no fee for the exchange. I think this is further evidence to the fact that even the utility companies are acknowledging the health effects of Smart Meters and would rather swap out my meter than contend with publicity or legal action. Next, I intend to share this article with my neighbors as a call to action. It is possible that in the years ahead that the utility companies will charge a monthly fee to read the meter, but I’ll be happy to pay for the service, won’t you? Please act. You can also add a shield over your smart meter from Amazon. However, this is expensive so consider Riun Ashlie, Electromagnetic Radiation Assessment Specialist, 720-557-3369, riun@neuralvitalnetworks.com. Riun can assess your home and everything electric, as well as sources of radio frequency (RF) radiation and dirty electricity (DE) with a range of sophisticated and sensitive sensors. Where there are electrical errors, dirty electricity, or high levels of RF, he can offer solutions. And he is dedicated to ensuring that your place of sleep is conducive to the recuperative rest your body needs to support optimal vitality. He also can install inexpensive shielding options for EMF-emitting devices, including smart meters.